» Art & Math? Who Knew?!? Art & Math? Who Knew?!? I started taking a drawing class. The sad part about this is that art is subjective and personal and yet somehow we all hold ourselves up to a standard that seems unattainable. Art is also a great way to express ourselves and stretch that creative part of our brain that we may not otherwise be using as much as we could. So, as a part of practicing what I preach, I signed up (with my husband John) for a beginner’s drawing class. I’ve only been to two classes so far (the third one is tonight) BUT let me share with you all the cool things I’m learning. First of all, yes, just like with math, we can all learn to draw better. I’m not claiming that we can all be award winning artists but we can certainly get better with patience, practice and good instruction. 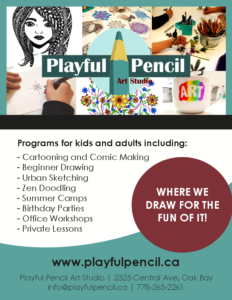 I’m loving my art teacher, Jodi, at Playful Pencil (Oak Bay) and she is often reminding us to be patient as people sigh in frustration because their first attempts (or second or third attempts) aren’t looking as they’d hoped. This has truly been an experience in growth mindset for me and I know that because I’m approaching this with such a positive attitude I’m enjoying the process a whole lot more than if I were criticizing and judging myself, or expecting to be perfect. Now, here’s the part that I didn’t expect, although in hindsight I totally should have. For years I have heard people say how art and math are connected (I figured proportion and measuring were the main components of this) but now I understand it in a whole new way! Proportional reasoning is such a tricky concept for students when we teach it abstractly (with numbers) but with art, it all makes so much more sense. 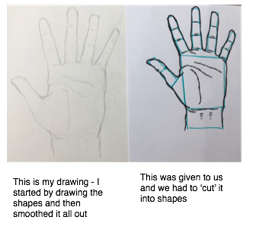 I had an ‘a-ha’ moment trying to draw a hand, I learned that need to make sure that my finger length is proportional to my hand length, otherwise it looks really weird (I know this from experience). 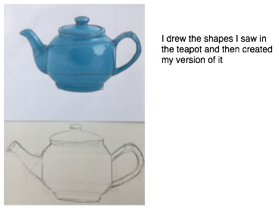 Along the same lines, I learned that when drawing something smaller than the actual size of the object, then I need to make sure all parts of the object are in proportion. I haven’t crafted any lesson plans just yet, but I do have some ideas brewing on how to incorporate math into art and art into math. I tried very hard not to ‘math-geek out’ in the class but I was not expecting there to be so much math in art….super excited that there is of course – so now I want to learn how to best utilize this in the classroom. I’m thinking that we could incorporate this drawing technique while learning about geometry and naming shapes and determining which shapes can be seen in an object. I believe that taking art classes like this could also help children with their visual-spatial understanding. 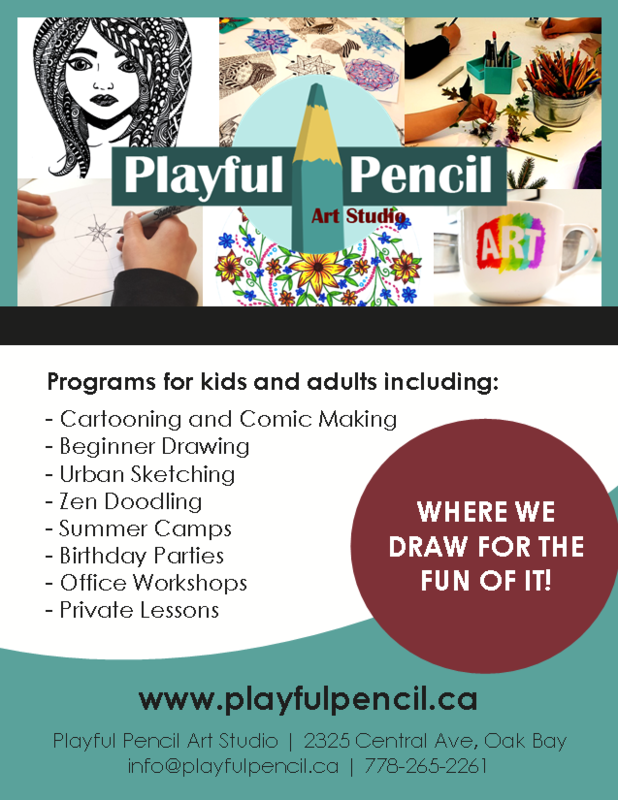 The Playful Pencil offers children’s and adult programs. I find that younger kids really enjoy art but as they approach middle school some start to really dislike it (probably for similar reasons that adults do- they think they are not good at it). I would love to see older kids practicing their own growth mindsets and trying an art class. The last benefit that I’ve noticed from this class is that when I am drawing time just evaporates. It’s being ‘in the zone’. It’s incredibly therapeutic and it again makes me a little sad that most of us adults would never try it due to fixed mindsets on our artistic ability. Even if you aren’t any good (yet), you would benefit from the meditative practice and focus that it requires. I highly recommend trying something new (and scary). Your students, children, nieces, nephews, grandkids, etc may find motivation from you AND you may find it to be a surprisingly enjoyable process all around – I sure have. Can’t wait to see what we’re going to learn tonight!